That’s it! There it is. I made another butterfly two more butterflies and gave one to my mom. I mailed the first one to a friend. I made a ring of rings over on the left, a bunch of practice rings, a lil turtle, a daisy. Note the half formed butterfly on the right. The only thing about tatting that makes it really frustrating is that if I make a mistake, I either have to undo a bunch of knots, or start over. I’ll never complain about fixing knitting or crochet again. I think learning to knit was much harder, but this is a fiddly craft, I’ll say that. It’s very pretty though! I’m going to try to make a shamrock next, then a fancier one. I know I already said it’s frustrating, but the interesting thing about that is it isn’t maddening. It isn’t scream-inducing. If I mess up, I have to start all over. That’s just a snip and a couple knots and off I go. I have been known to throw knitting/crochet on the ground, then stuff it in the closet for awhile (sometimes years). 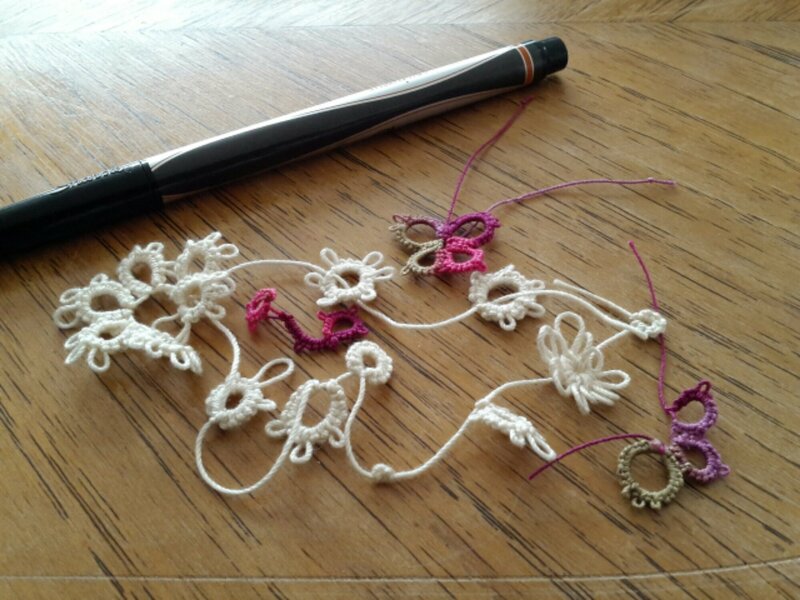 I don’t know why tatting, a craft of unforgiving knots, is less stressful but there it is. On that note, I am 5 rows away from finishing the Bat Shawl! They’re looooong rows, though. Still. The end is in sight! Supported by Fast Stack Development, LLC.